Hosting an apartment Super Bowl party? Be sure not to skimp on the appetizers! Adding a football flare is a great way to be festive. It is almost Super Bowl 50 time! On February 7th at 6:30 p.m. the Carolina Panthers will battle the Denver Broncos for the title of 2016 Super Bowl Champions. Do you have an apartment party planned? Let’s be honest – watching the Super Bowl with a great group of friends is sure fire entertainment, even if your beloved team didn’t make the cut. The Apartments of Wildewood is here with a few tips to make your apartment Super Bowl party as awesome as possible. One of the best parts about a Super Bowl party is the food. 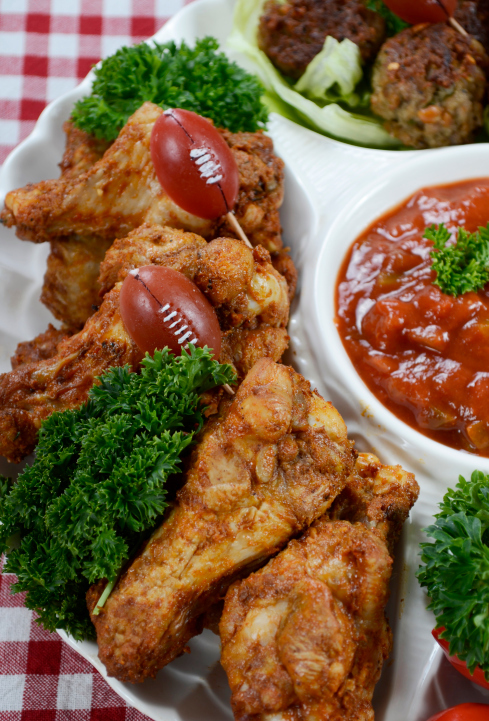 Some ideal game day foods are: party dip, nachos, chicken wings, pretzels, meatballs, potato chips and pigs in a blanket. If you want to minimize the cost of feeding your guests, make it a potluck (where everyone brings a dish)! Potlucks are great for apartment parties since your kitchen space is limited. Make a Facebook event for your party and create a public list of what each guest is bringing, to avoid repeat dishes. Oh yeah, and don’t forget the beer and soda. Since you have other tenants surrounding your unit, it is common courtesy to inform your neighbors that you plan on hosting a party in your apartment and make sure they don’t have any problems with it. Be sure to provide them with an easy way to reach you if they need to put in a request for quieter music, television, etc. You should also contact your landlord and ask how many guests you are permitted to have in your apartment and if there is a curfew for noise. Once your landlord tells you how many guests are permitted, be sure to limit your guest count to that number. You may have to refine your guest list. Invite the friends who live closest to you to ensure no one is tempted to drink and drive. If you have guests coming from further away, ask them to carpool and plan for a designated driver. Additionally, if you have friends that are much louder and more rambunctious than others on the list, consider that when making your cuts. Do your best to make sure there is enough seating and extra chairs for everyone on your list to watch the game comfortably. This entry was posted on Tuesday, February 2nd, 2016	at 3:07 pm	. Both comments and pings are currently closed.